Available for $995 + $200 per year, SOX User Management bridges the gap between Sage 300 (Accpac) and enterprise solutions by providing mechanisms to manage user setup and permissions. A full set of features includes reporting on permissions as well as copying and removing setup data - for one or all users - for one or all companies. See features list below. Windows authentication is supported for domain users. Proxy ADMIN users can be authorized for strict SOX environments. 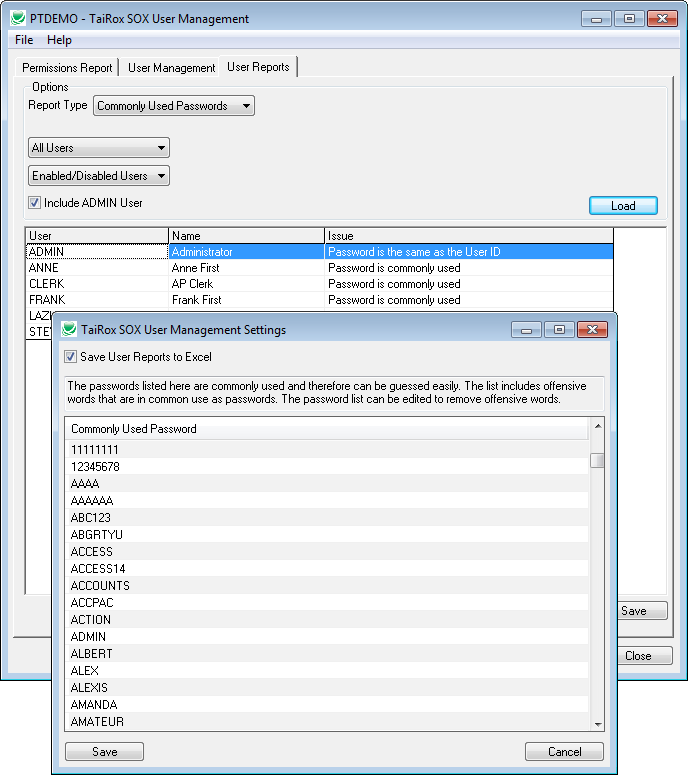 NEW - User Reports: create 7 different reports from information pulled from the user files maintained by Administrative Services: User Profiles, Locked Out Users, Disabled Users, Expiring Passwords, Advanced Security Settings, Commonly Used Passwords and Password That Never Expire. The reports can be saved to spreadsheets. 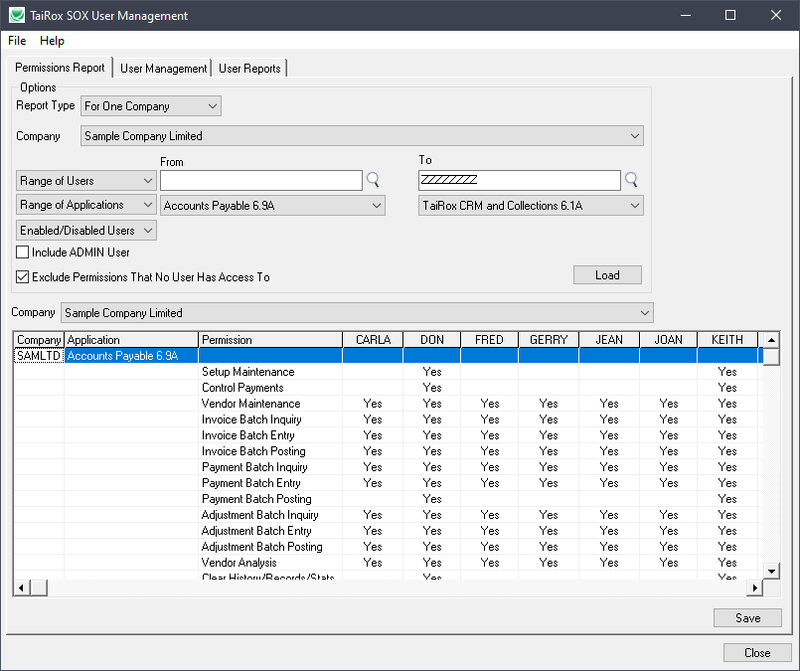 Permissions Report: Create a concise display and spreadsheet based report showing Sage 300 users and permissions for a given company or set of companies. Such reports are typically requested during a compliance audit such as Sarbanes-Oxley (SOX) and are useful when managing relatively large installations. The report can be saved to a spreadsheet. In the features and benefits list Everyone's setup means the desktop folders, macros, reports and programs that have the checkbox All Users selected as illustrated below. Implementation consultants may know that these are stored in a pseudo user folder _EVERYONE. 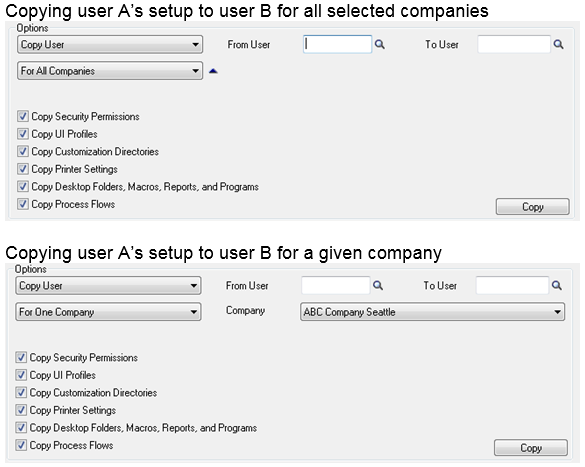 • Copies user A's setup to user B for all selected companies. 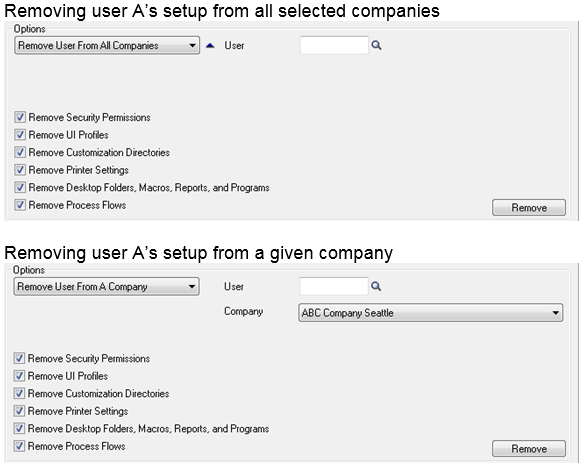 • Copies user A's setup to user B for a given company. 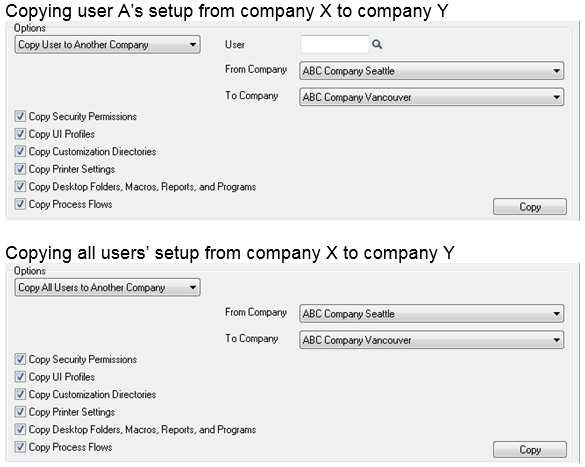 • Copies user A's setup from company X to company Y. • Copies user A's setup from company X to all selected companies. • Copies all users' setup from company X to company Y. • Removes user A's setup from all selected companies . • Removes user A's setup from a given company. • Removes all users' setup from a given company. • Removes all users' setup from all selected companies. • Copies Everyone's setup from company X to company Y. • Copies Everyone's setup from company X to all selected companies. • Removes Everyone's setup from a given company. • Removes Everyone's setup from all selected companies. • Copies Security Groups from one system database to another. • Assembles report data from system and company databases, user files and language resources. • Permission reports typically print on 2 to 3 pages, even for relatively large Accpac installations. • The permissions spreadsheet can be formatted, emailed and printed using Excel. 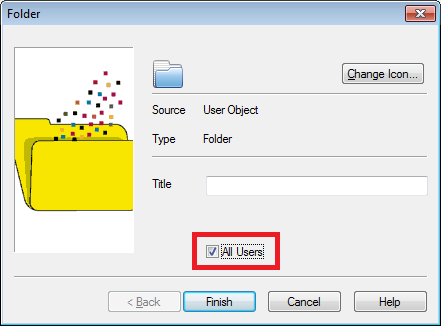 • Saves data in both xls and xlsx formats. • Supports Windows authentication for domain users. • Proxy ADMIN users are authorized for strict SOX environments. • User Profiles report shows all user related data. • Locked Out Users report shows only those users. • Disabled Users report shows only those users. • Expiring Passwords report shows users whose passwords will expire and when. • Advanced Security Settings report shows settings common to all users. • Commonly Used Passwords report show weak passwords that can easily be guessed. • Passwords That Never Expire - when security does not require users to change their passwords. • Saving reports to Excel requires Microsoft Excel 2007, 2010 or 2013.